If you’re in the mood for a quick treat and a little boost in performance, these homemade gummy treats are just what you’re looking for. They’re satisfying, chewy, and delicious — and they just might help you get to the next level during your workout. The combination of exogenous ketones to push you into a deeper state of ketosis, plus the protein punch coming from the gelatin make these gummies a fantastic snack for pre-workout or when you just feel like you need a pick me up. Gelatin powder comes with a host of health benefits from gut healing to satiety inducing, so making this gummy candy a staple in your diet would serve you well. Blueberries are one of the most antioxidant-rich fruits out there. Their antioxidant activity comes from phytonutrients like anthocyanins — which give blueberries their beautiful deep purple-blue color[*]. Research shows that anthocyanins, and therefore blueberries, support both heart and brain health[*]. One way blueberries can support your heart is by protecting your LDL cholesterol from oxidation. Oxidized LDL particles can lead to the progression of plaques in your arteries, which can eventually lead to heart disease[*]. Exogenous ketones provide a source of fuel for your muscle cells during exercise. This additional boost in energy molecules may allow you to hold on to more glycogen (stored energy in your muscles) so you can work out longer and faster. In one study, researchers gave a group of athletes exogenous ketones (specifically beta-hydroxybutyrate) and then measured their exercise performance. The athletes not only increased their endurance, but also increased fat burning during the workout — even in the presence of co-ingested carbohydrates[*]. Gelatin is a type of protein that comes from collagen, and is most well known as the main ingredient in Jell-O. But don’t be fooled, this protein provides more than the gummy texture in these vanilla blueberry gummies. Research shows that consuming gelatin may have a significant impact on your satiety. And is there really any better combination than a sweet treat that makes you feel full and satisfied? In one study, researchers gave a group of people gelatin and then measured several hormones and markers for hunger and satiety. They found that a single dose of gelatin was able to increase levels of insulin and may be applied as a way to maximize satiety in obese patients that are following a calorie controlled diet[*]. If your go-to treat is a package of sugary gummy bears, then these homemade gummy treats are your keto-friendly savior. The grass-fed gelatin and exogenous ketones take your standard “fruit snacks” to a whole new level. Simply grab some coconut milk or almond milk, throw them in a blender with some blueberries until well combined and sweeten with stevia or monk fruit. Next, in a small saucepan over medium heat, add your blueberry mixture, gelatin powder, and exogenous ketones while whisking slowly. 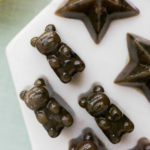 Once everything is dissolved, fill your silicone molds or candy molds with the gelatin mixture and place in the refrigerator for 15 minutes or until firm. Eat them fresh or set aside for later and store them in an airtight container in your refrigerator. Add the blueberries and almond milk to a high-speed blender, blending on high until well-combined. Add liquid stevia or monk fruit to taste. In a small pot over medium-low heat, add the blueberry mixture and, while whisking, slowly add in the exogenous ketone base and grass-fed gelatin. Watch until everything has dissolved and remove from heat.